This infographic reacts to national data on hospital readmission rates and suggests strategies for reducing rehospitalizations and avoiding CMS penalties for unsatisfactory readmission rates of Medicare patients. This infographic from the Healthcare Intelligence Network consolidates the protocols and strategies many organizations are using to dramatically reduce the number of Medicare beneficiaries that return to the hospital within 30 days. 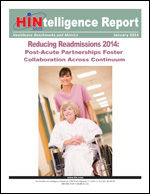 More information on this topic can be found in HIN's free report, Reducing Readmissions in 2014: Post-Acute Partnerships Foster Collaboration Across Continuum. This report includes details on readmission program components, successful work flows, processes and tools; how organizations are preparing for CMS scrutiny in 2014 and 2015, and much more.